Upon the death of his father in 1831, Morgan and his mother, Rebecca Johnson Swain, were appointed to administer the estate. A series of advertisements in The Milledgeville Southern Recorder announced the sale of Canneth Swain’s property, personal and real. Announcement of the estate sale of the personal property of Canneth Swain, Aug 2, 1932. 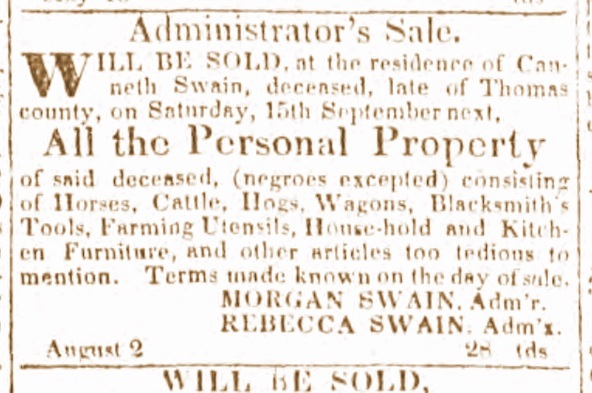 WILL BE SOLD, at the residence of Canneth Swain, deceased, late of Thomas county, on Saturday, 15th September next, All the Personal Property of said deceased, (negroes excepted) consisting of Horses, Cattle, Hogs, Wagons, Blacksmith’s Tools, Farming Utensils, House-hold and Kitchen Furniture, and other articles too tedious to mention. Terms made known on the day of sale. Advertisements were also placed for the sale of the livestock owned by Canneth Swain. WILL BE SOLD, at the former residence of Canneth Swain, deceased, late of Thomas county, on the 30th November next, about 200 Head of Hogs and the Crop made this year, on said plantation, together with numerous other articles. January 24, 1832 announcement of the sale of Canneth Swain estate. 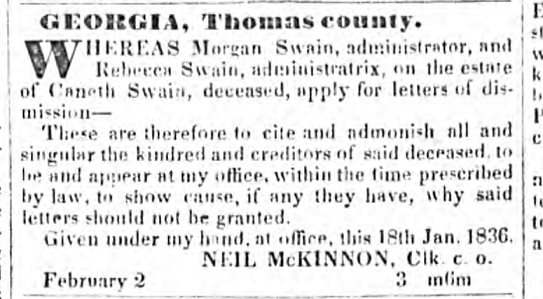 ABOUT 400 head of Stock and Beef Cattle, together with other kinds of Personal Property, will be sold at the late residence of Canneth Swain, deceased, of Thomas county, Georgia, on the 29th of May next. Sale to continue from day to day until all are sold. 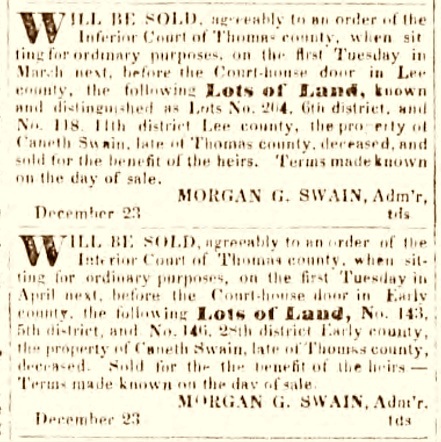 Finally, the administrators began the sale of Canneth Swain’s real property, again advertising in The Milledgeville Southern Recorder. Announcement for the sale of Canneth Swain’s real property, July 7, 1834. FOUR months after date, application will be made to the honorable the Inferior Court of Thomas county, when sitting for ordinary purposes, for leave to sell the real estate of Canneth Swain, deceased, for the benefit of the heirs and creditors of said estate. Announcement for the sale of Canneth Swain’s land in Early and Lee counties, January 6, 1835. WILL BE SOLD, agreeably to an order of the Inferior Court of Thomas county, when sitting for ordinary purposes,on the first Tuesday in March next, before the Court-house door in Lee County, the following Lots of Land, known and distinguished as Lots No. 264, 6th district, and No. 118, 11th district, Lee county, the property of Caneth Swain, late of Thomas county, deceased, and sold for the benefit of heirs. Terms made known on the day of sale. WILL BE SOLD, agreeably to an order of the Inferior Court of Thomas county, when sitting for ordinary purposes, on the first Tuesday in April next, before the Court-house door in Early county, the following Lots of Land, No. 143, 5th district, and No. 146, 28th district Early county, the property of Caneth Swain, late of Thomas county, deceased. Sold for the benefit of the heirs – Terms made known on the day of sale. Having completed the liquidation of the estate of his father, Morgan Swain and his mother applied for letters of dismission. June 7, 1836, advertisement for dismissal from administration of the estate of Canneth Swain. These are therefore to cite and admonish all and singular the kindred and creditors of said deceased to be and appear at my office, within the time prescribed by law, to show cause, if any they have, why said letters should not be granted. Given under my hand, at office, this 18th Jan, 1836. NEIL McKINNON, Clk. c. o.
I would like to know more about Rachel Swain Folsom wife of Dr. James Roundtree Folsom. She was the Daughter of Sheriff Swain. Do you have any information on her?